POLL: Best Krizz Kaliko And Kutt Calhoun Collabo? 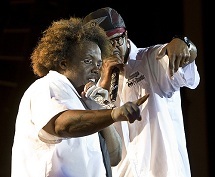 Smashing the whole music industry like a dynamic duo of sorts, Krizz Kaliko and Kutt Calhoun have always proven to be a perfect combination of skill and charisma. With Kaliko’s off the wall delivery and Kutt’s real life tales from the street, the pair create a unique contrast for each other. Spanning Kaliko’s albums, we would like to know what you consider to be their best collaboration. Vote below for the best Krizz Kaliko and Kutt Calhoun collaboration. Best Krizz Kaliko And Kutt Calhoun Collaboration?